This post may contain affiliate links. Please read our disclosure policy for more information. 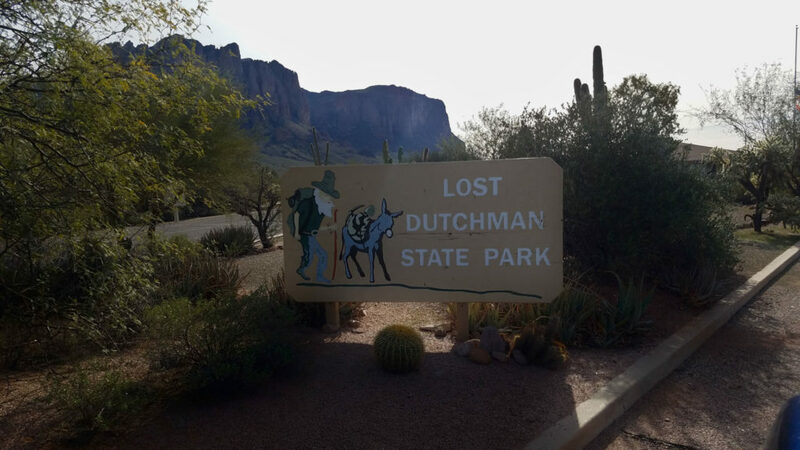 Thank you to Arizona State Parks & Trails for the passes to experience the Lost Dutchman State Park. All opinions, photographs, and videos of the area are ours. 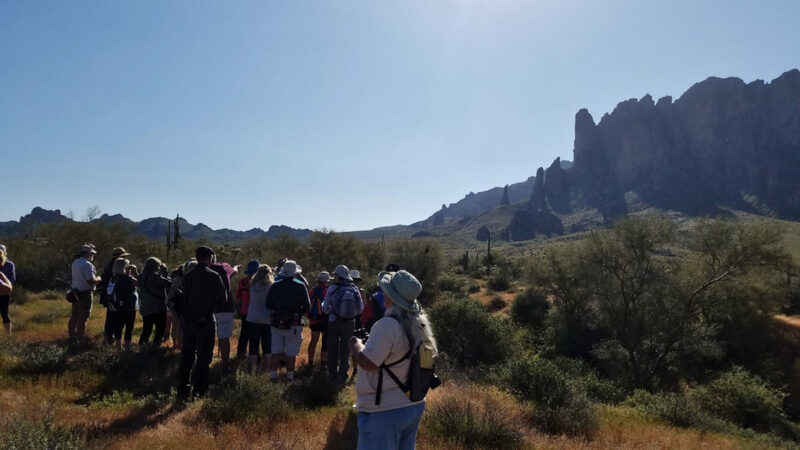 Exploring Lost Dutchman State Park in the Arizona Superstition Mountains on a bird walk is a wonderful way to start a morning. Spotting birds, calling birds, and listening for bird songs can be easy if you have the right teacher. Join us as we venture into birding. In the early cool morning, we meet our bird identifier volunteer Vera. Vera is an incredible person. She shares her bird knowledge with humor and is very entertaining. She had us all laughing throughout the morning. We meet at the Native Plant Trail parking area on the right before reaching the ranger station. We had a great group of about 40 people. The park suggests wearing appropriate clothing as we are walking in the desert, such items as a hat, a good pair of shoes and sunscreen. 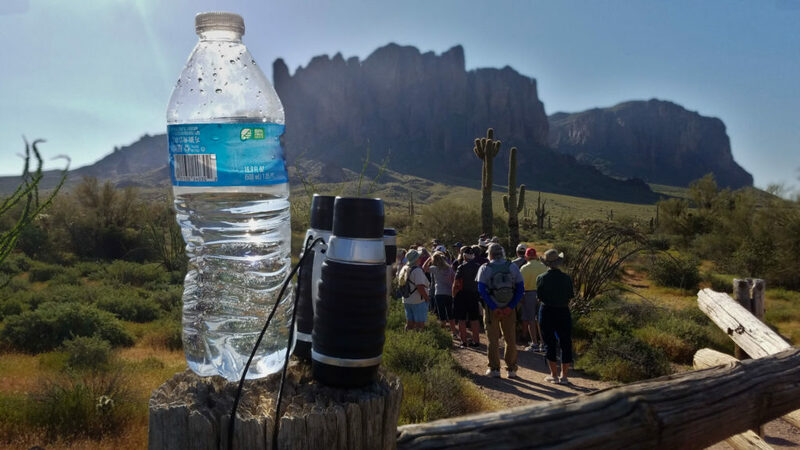 Bring lots of water and a bag to carry your water because your hands will be holding your binoculars most of the time. On the park’s website, they also suggest bringing your enthusiasm. I made sure to put it in my pocket and got it out when we arrived. The park kindly requests: no dogs or small children. #3 in the US for most species of birds. #1 in the US for most species of hummingbirds. Arizona has 17 species. #1 in the US for most species of owls. Arizona has 12 species. 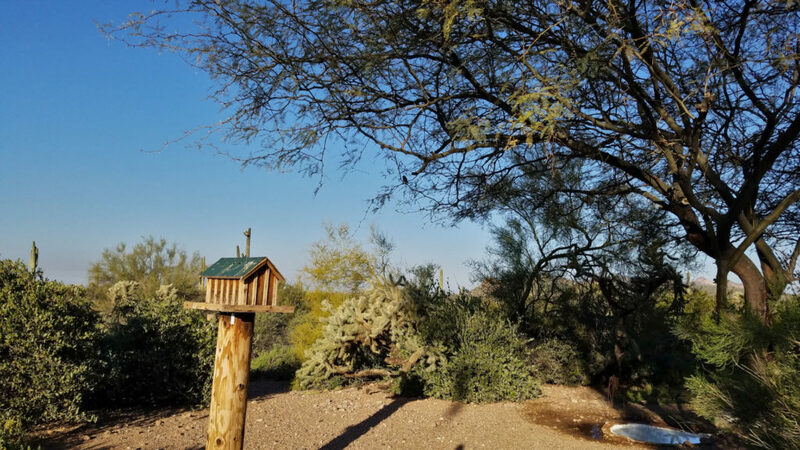 In the Lost Dutchman State Park and next to theBird, Binoculars, Bird identification, Birding ranger station is a birdhouse and bird pond. Many birds will visit this area in the early morning, making it a wonderful place to sit and observe. Vera also hung up a hummingbird feeder at the picnic area at the beginning of our walk, so that when we returned at the end of our walk there might be a few hummingbirds. Spoiler alert – there were many when we returned. 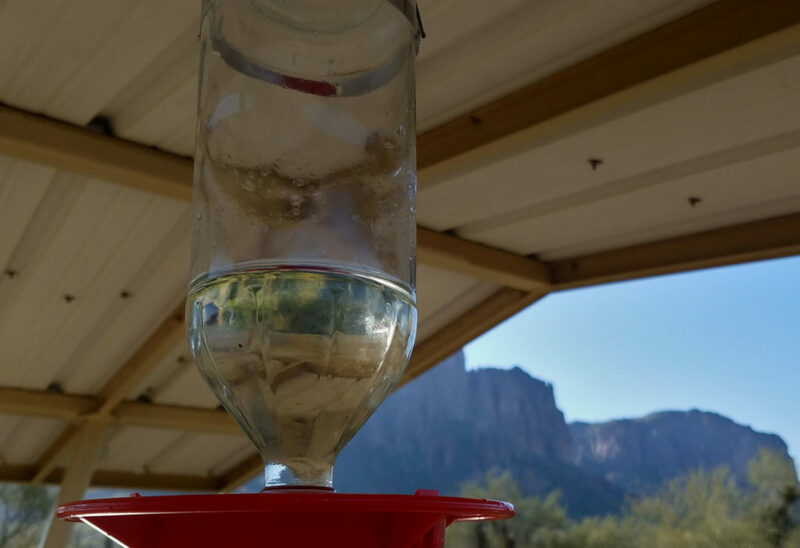 Tip: 4 water to 1 sugar ratio for the hummingbird feeder. Don’t need red dye. 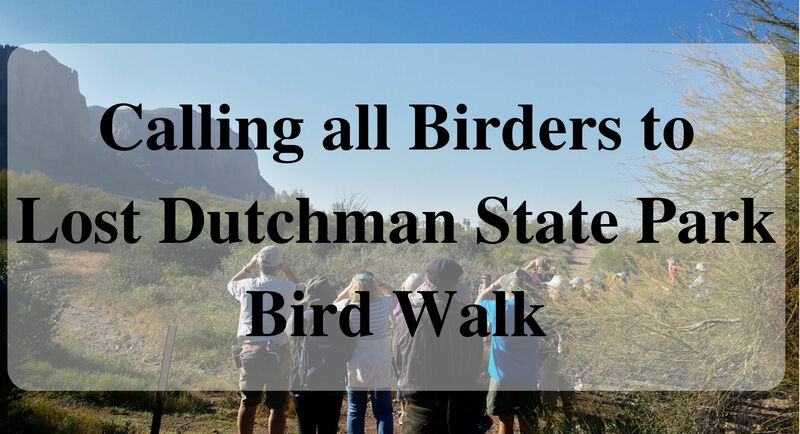 There are multiple washes in the Lost Dutchman State Park and many birds will nest and feed there. This is a good place to sit down on the ground and listen to the bird calls. 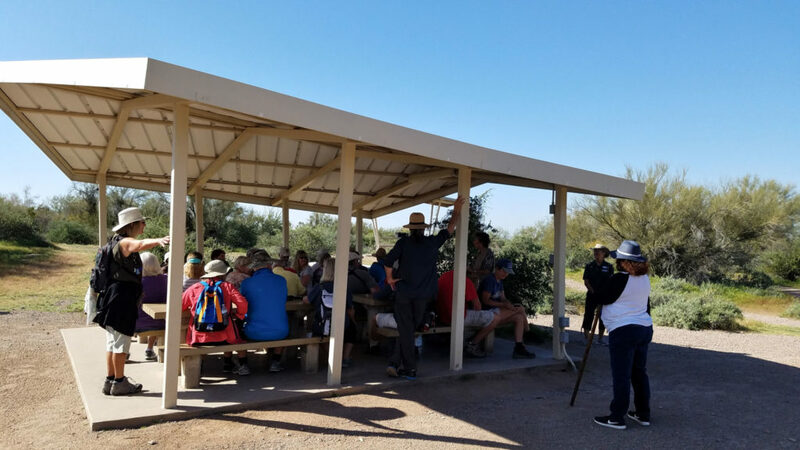 Vera guided us on a walk through the desert to practice our new skills of birding. Skills included: identification by size and features – listening to bird calls or songs. On our walk, Vera idenitified many birds, which I was unable to write them all down. Here are the few that I did write down: quail, house sparrow, turkey vulture, hummingbirds, cardinals, and dove. 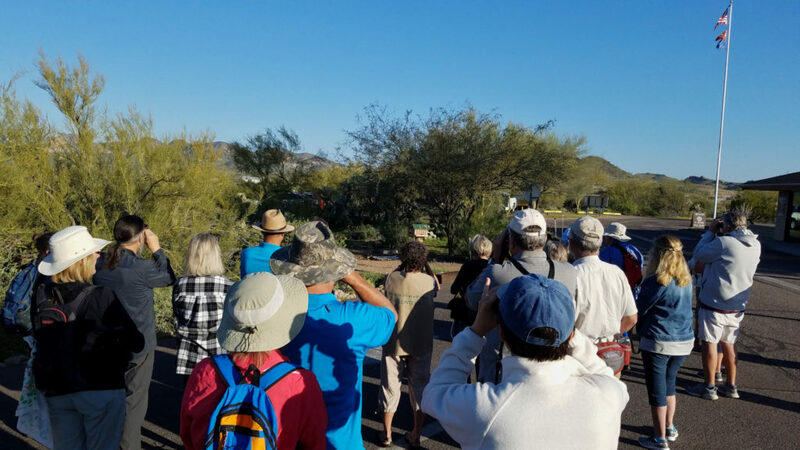 Have you been on a bird walk? What did you see? That is awesome that you love bird watching! My grandma loved this activity and it always reminds me of her when I see things about birds! That is nice, thank you. Great way to start the morning. Watching birds is so relaxing. Yes, it was a great way to start the morning. What is your favorite bird? What a fun way to learn more about birds! You are right, it was a fun way to learn about birds. It was cool. The birds were so peaceful. This would be so great for my girls worldschooling lesson. Looks fun! Your girls would love it. I have always wanted to start birdwatching but have not made the time! I love birds though. Start by watching what is in your neighborhood. Love hummingbirds! Thanks for the info! Me too. They are so cute. I just saw an article that stated that bird watching was one of the best activities for relaxing. I think I will need to try this…. Looks fun. I’ve never done a bird walk, but a few of our local parks offer them and I’ve always thought it would be a neat experience – I’ll have to check it out for sure now. Yes, do check it out. You will learn a lot. I’ve never done any birdwatching besides what goes on in my own yard, and this looks like so much fun! Birding in your own yard is fun too. I’d say the hummingbirds are smart hanging out in Arizona. We get a lot of them in Colorado, but only in the summer. My dad is a bird photographer and lives in AZ. We haven’t heard of this park, I told him all about it!! Wonderful, he would love it. I agree Hummingbirds are beautiful. So Relaxing. Thanks for sharing. I love learning facts while traveling. Especially since we homeschool Payton. We are always trying to incorporate education into everything we do. She would have enjoyed learning the facts and then sharing them with everyone when we returned home! Great article. Yes, this would be a great activity for homeschoolers. My kids would love this! I love finding educational things like this that are fun! I agree. Outside learning creates a different experience. My youngest is obsessed with birds. He loves to watch them on his bird feeder. This sounds like a great experience for everyone! I agree, watching birds is fun. I love to paint birds so this would be a great activity for me. I’ll have to see if they have these type of guided walks in my area. Thanks for the tips. We lived in Phoenix for a few years and visited Superstition often…but never for bird watching. Now I feel like we missed something.